The front door makes a statement that sets the personality of the rest of the house. It is the second thing people notice, behind the front yard. 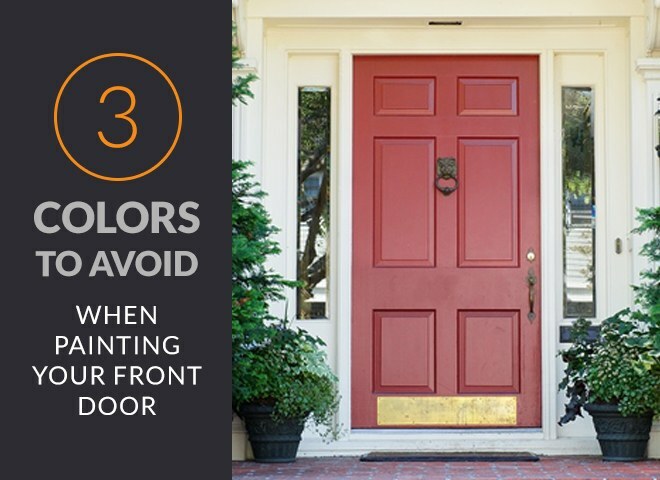 Whether you’re looking to sell your home or you want to create a more welcoming entrance to your home, the color you paint your front door can make all the difference. Yeah, your eye is drawn to a home’s front door. So, what? You likely felt some emotion when you looked at that front door. Maybe it piqued your interest or creativity, made you feel relaxed, happy, or energized. The color of the door may look elegant, inviting or plain weird. Most people either paint their front door in a color that matches or compliments the color scheme of the rest of the house’s exterior or they paint the front door in a bold, bright, contrasting color. Neither of these approaches are wrong. It depends on your personal style and personality. Yes, the color of your front door tells others about your personality. The color of your front door will shape the expectations others have of the inside of the home. Red front doors are a huge trend right now and the fad doesn’t seem to be disappearing anytime soon. A red front door indicates action and that the owners are “go-getters.” Red gives warmth, vibrancy and excitement without being too wild. Purple gives off an air of sophistication and royalty. If you’re selling your home and you have a purple front door, prospective buyers will expect the home’s interior to be neat, and luxurious. Purple indicates order and perfectionism as well as generosity and helpfulness. Yellow is eye-catching and indicates individuality, creativity, logic, optimism, cheerfulness and extraversion. Guests to homes with yellow doors expect cheerful and sunny rooms inside. Be careful not to go overboard with the yellow. Painting your whole house yellow, for instance can indicate anxiety and irrationality. Blue is the most popular paint color. Why? It indicates inner peace, truth calmness and trust. In fact, doors painted bright blue bring in more visitors than any other color. Black doors indicated glamour, formality, tradition and seriousness. Black doors also give off a sense of protection and security. Black doors work great with light, colorful colors. This simple, plain color gives off a sense of cleanliness, simplicity and sterility. Guests will expect a home that is clean and organized. While most colors are safe to use, there are three colors you should avoid. There is a good reason why orange is one of the cheapest paint colors. It is bright and energizing, but not sophisticated. This unique color indicates the need to be respected and accepted, it also indicates that the homeowners seek out challenges. Orange doors are rare because it is hard to pull them off well. If you’re looking for something truly unique and different, however, an orange door can be for you. Orange doors are not commonly seen because they send the message that the owners are either cheap or weird. The only homes that can pull off an orange door are those with orange accent colors, such as a dark gray, or are expensive, luxury homes. Brown has been the traditional front door color, common in years past. Now this color indicates cheap, boring, dated and plain. Dark brown doors also look somber. While brown is not necessarily a color to be avoided on the exterior of your home, it shouldn’t be on the front door. Green doors add vibrant color to your home and is one of the most popular front door colors. Green traditionally indicates wealth, prosperity, peace and serenity. Green is often associated with plants and nature. Vivid green hues add personality and make a statement. Light or overly pale green hues, such as sage can be bland and boring. These softer green hues are hard to compliment with other exterior paint colors: it is too light to compliment other light, muted colors and it has too much color to contrast darker, vibrant colors. If you’re looking to paint your front door and need advice on color selection or have it professionally painted, contact the Painting Company today.